Good for you Harith. I can't stand people who are both ignorant and arrogant like your "democrat" friend here. The Western form of democracy is the biggest hoax being pushed down humanity's throat in modern times. You're voting for polished ppl based on their "PR Campaigns" and what they make you believe they're going to do for you. Once they get into office, they will serve the interests of corporates and organizations who supported them. Obama is the biggest example I have. All that talk about change, and I barely see anything changing. All reforms have been watered down and military spending is still going up the roof. Plus, your friend who is under the impression that democracy will magically transform society, can maybe explain why did it take some democracies a very long time to recognize that Blacks are full human beings and women are persons. Women in Canada had to go to court in the 1920s to prove that they are persons!!!!!!!!!!!! Ya Harith ya sadeegi, thank you for posting this. I know it is better discussed over a cup of coffee in Abu Dhabi or San Francisco but priding myself as both a Muslim and a Democrat I tend to think that there was a mutual oversimplification for the two things by you and your friend. Shura WAS ok at the time, but we witnessed over the ages hundreds of regimes and dictators claiming to practice Shura. In these modern times with their complexities it wouldn't suffice to say you will practice Shura, you have to specify what type of shura and how are you going to implement it. Once you get into such details you are actually discussing democracy. 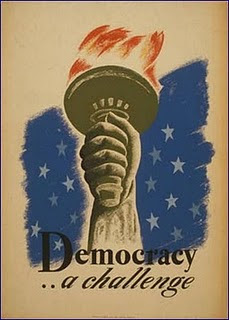 Democracy might not be the ultimate answer to humanity's questions, but is definitely the best alternative we have. It gives the people the chance to evolve and build over it. The examples you gave, although good ones, can be countered by facts that say otherwise, it all depends on what exactly you are trying to analyze, prove...etc. China, for instance, attained a great economic growth, but how did this benefit the millions of people who live in rural areas, let alone the basic freedoms taken away from people allover China. As for Iraq, it's depressing but if you study the history of Saddam's era you will realize that regardless of all what is happening now this is not compared to the massacres that he and his regime commit, and don't you agree that what is going on right now is due to a great part to his actions?